We love to decorate for the Holidays, but store bought decorations can be so expensive! DIY supplies can be expensive! We went a few years without really decorating much because we couldn't afford it. Or that's what we thought. The past few years we have decided that we are going to find ways to decorate the house for various holidays without having to shell out a ton of dough. Will you ever see our house in a magazine because of our decorations? Heavens, no. Are some of the decorations slightly cheesy? Yes. But we found it is way more fun to have cheap and cheesy decorations and to add some festivity to the house than it is to just wallow in our poor pity and not do anything at all. So...I know the major holiday season is still a little ways off, but it'll come fast. I'll show you some of the things we've done for each season around the house, and some of our plans for future cheap seasonal decor. 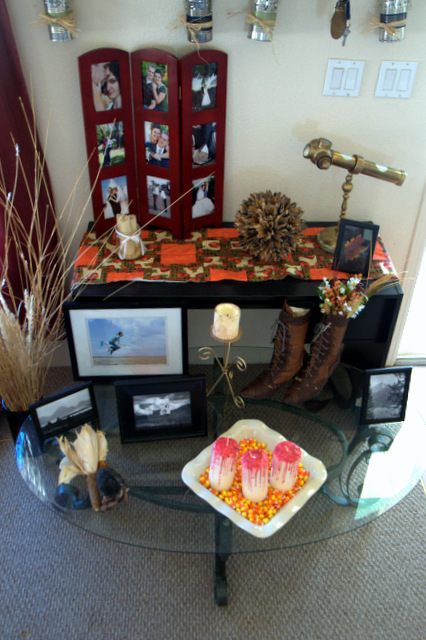 Our biggest "trick" when decorating for Autumn is to try and incorporate nature into our decor. Autumn is so full of great colors and textures. Take a walk in your neighborhood and see what you have around you. This can work in rural or urban surroundings. Pick up leaves, nuts,dry and dead flowers, grass, twigs, rocks, etc. You can put these in bowls, vases, on wreaths, topiaries, etc. With the rocks you can even pick up boring ol' gravel pieces and paint them (solid colors or designs) to fill a vase or bowl. A few years ago I went out in my front yard to gather acorns to put in a bowl and found that the animals had beat me to them. But, there were still a ton of the acorn "shell" tops left, so I gathered those up, along with a bucket full of yucca pods. Luckily I already had 2 Styrofoam balls on hand (I don't remember why), and so I glued the acorn shells and the yucca pods to the balls to make a topiary and a yucca ball. I love the color and naturey touch they add to the house, especially during the fall. Use nature items (gourds, leaves, rocks, etc.) as name "cards" for a fun autumny dinner. My husband's favorite holiday is Halloween. I'm not a huge fan of gruesome Halloween decorations, or the overly cheesy Walmart decorations, so the past 2 years I've worked hard to come up with our own style of Halloween decor. Bloody Candles: Pinspired Project (see next picture). Troll (by the corn): Gift from my brother-in-law from his time in Norway. 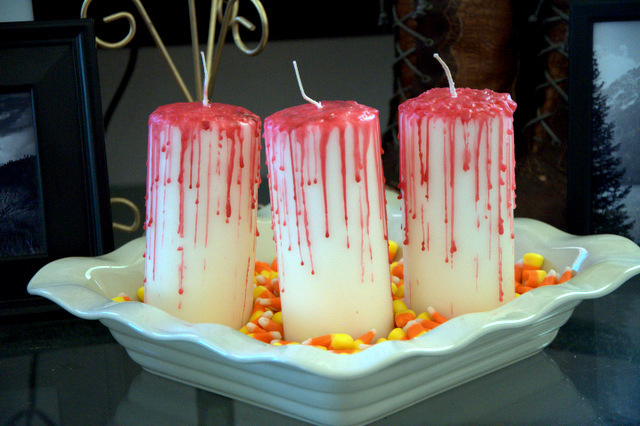 To make these we lit a red taper candle and let it drip on the white candle, turning the white candle as needed. 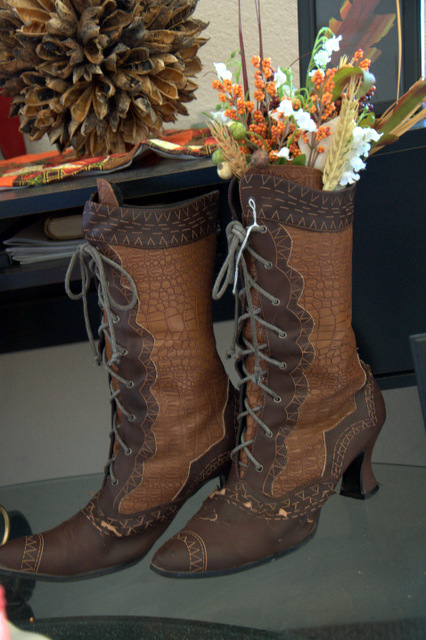 I found these boots at a local thrift/antique/consignment shop and had to have them as they were only $10. They are way to small for my feet but I knew they'd make a fun fall/Halloween centerpiece and/or decoration. 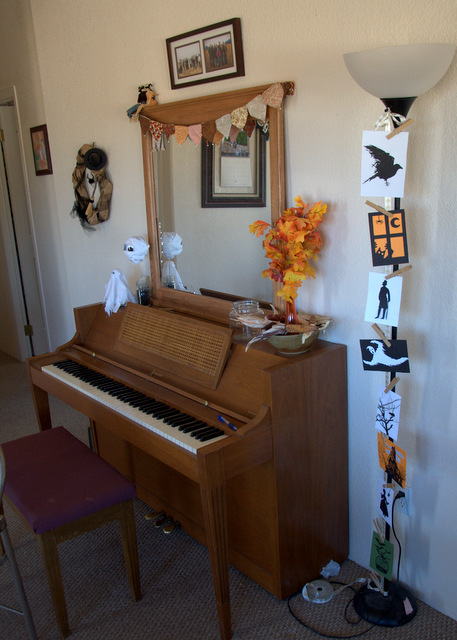 Halloween Silhouettes hung on a ribbon with clothes pins: DIY from previous year. These always get comments from visitors and they were so much fun and so easy to make! We keep these in a folder during the year so they don't get munched in the Halloween box. And then last year in the Dining Room was my Batmobile. Hehe...I'm so punny. The previous year these bats hung from my porch roof. 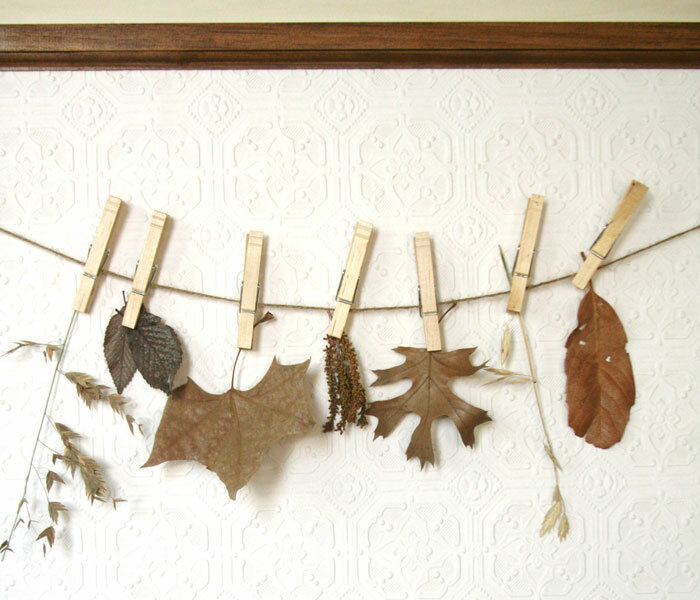 I love the look of the leaves and clothespins. 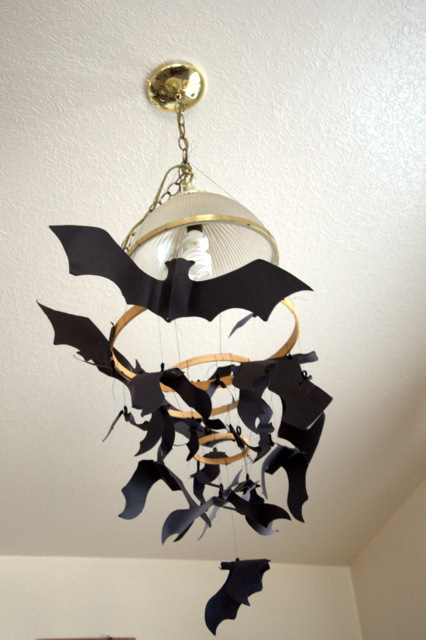 This would work great for just regular fall/autumn decor as well. 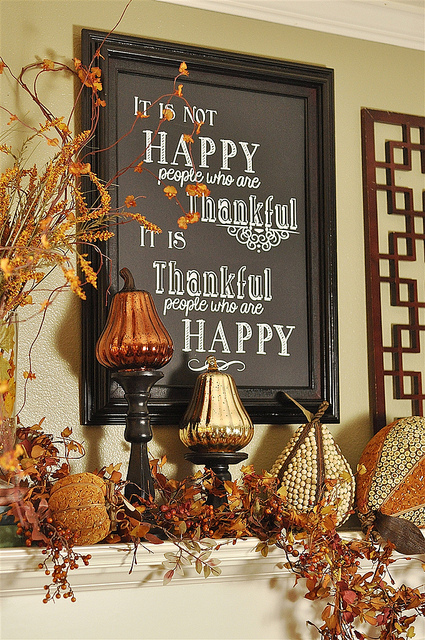 To make it Thanksgiving decor each leaf could have things we're thankful for written on them in gold or black ink. I like the quote more than the decor in this one. This could be written on a table runner, a chalk board, done up in a cool font in Word and printed out, etc. Our Christmas and Winter decor is all the same thing in our house. I always feel like we have a ton of Christmas decor, but then when we go to pull it out I find that we don't. Most of it is from my single days and our first year of marriage...so most of it is kinda corny and cheap. I've been working on getting a few more items made, but I haven't gotten very far yet this year (my goal was to make 5 decorations by September...I have one last one to finish up today to reach that goal). http://madebymarquette.blogspot.com/2011/08/tin-can-luminaries.html (this link shows step by step how I made these). I made about 10 of these for our 5th Anniversary dance that we held. I still have most of them kicking around. At the time I made them I used ribbons in our wedding colors to decorate the cans with, and I've just used them like that for Christmas decor, but I think this year I'm going to pull those off and use some Christmas ribbon, maybe some burlap (small amounts...I'm not a burlap-a-holic), maybe some mistletoe or pine clippings. We fill these with beans or rice for sturdiness and then add a candle (real or battery operated). We have a drawer in our kitchen where we store extra cans to use for projects like this. The blog this originated from is no longer online. We go and cut our own Christmas tree each year (we live where it's free to get a permit and the National Forest is just down the road), and it always needs a little bit of trimming up once we bring it home. Before we've just chucked the trimmed branches out in the yard but this year I think I'll save one or two and do something like this. We happened on this tradition completely by accident (you can read about that here). We needed to improvise a tree stand and after looking around the yard found these wood planter buckets that previous tenants had left. With the help of bricks, a no. 10 tin can, and gravel, we were able to rig up our own free tree stand. It's now tradition to use that bucket. Okay...we've only done it for 2 years now, but as long as that bucket holds up...we're going to use it as our tree stand. We made these for New Years with metallic wrapping paper we bought in the after Christmas sales. 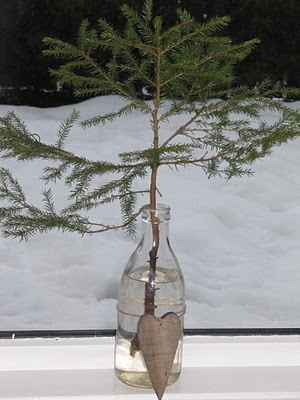 But I remember making these as kids for our Christmas tree. 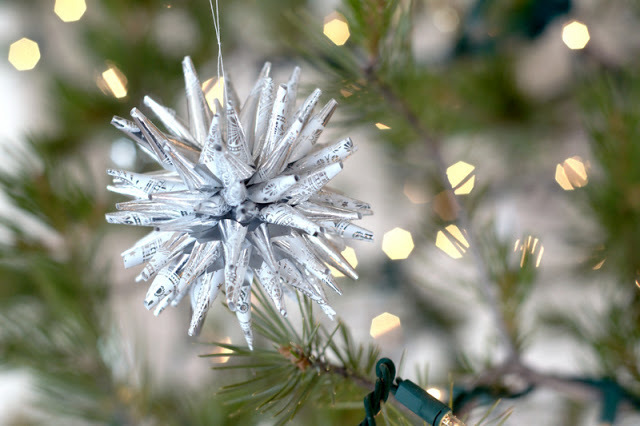 My grandparents made these out of newspaper for their Christmas tree when they were newlyweds and broke. These look neat out of pretty paper, regular paper, newspaper, etc. I'm really bad about doing any special decorations for the rest of the year. My house stays pretty much the same from when we take down the Christmas decor (anywhere from January to the end of March, lol) until we pull out the Autumn decor. I don't know why I don't decorate the rest of the year...it would be fun. I guess the rest of the year I usually just work on "regular" stuff for the house. Even during the "rest of the year" though, we keep our decorating as simple and cheap as we can. Most of what we have in our house are things that friends or family were giving away, things we found super cheap at the thrift store, and things we made. You don't have to spend a ton of money to be able to decorate. You don't have to be super artsy or crafty to create things for your living space. Don't know where to start? Start with pictures and photos. Hang them on your wall, put them on your book shelves, set them on your tables. Hang snapshots next to "formal" portraits. Find art pieces you like at your local thrift store (you can find gems amid the tigers painted on velvet, adorned with glitter and rabbit paws). Print photos your grandparents took. Write or print out a favorite quote or verse and frame it (we have some super cheap frames that I put around the house that we switch out contents when I find a new verse that inspires me, or something that I find beautiful). Don't worry about having the magazine or Pinterest perfect home. Use magazines and Pinterest as idea starters if you want, but don't think that your home has to look like that or it's not a home. Those rooms in those "manufactured" pictures were most likely only that way for as long as it took to take the picture. What makes a room feel light and loved is you. Live in it. Let it be yours. Let it have a pile of clutter...most of us do. Don't feel like you have to be Martha Stewart or a Kardashian in order to create or afford a beautiful home. It's your home, not theirs after all. Ever come across a pin you haven't seen before and just think it's absolutely genius?! And then you think, "I have been on Pinterest for two years now and spend entirely too much time pinning and I have never seen this! Where has it been hiding? " I found one of those today in the form of Robin's submission...check it out! The idea of this pin is to use old broken crayons to make a candle! Of course for this you will need a jar and most of us have at least a mason jar, or baby food jar either in our home or have access to one fairly easily. Also for this you would need a wick, or like Robin you can be super inventive...check out her version! Here Robin used her kids old broken crayons (she did this craft with the kiddos and let them pick their own colors) to make candles! 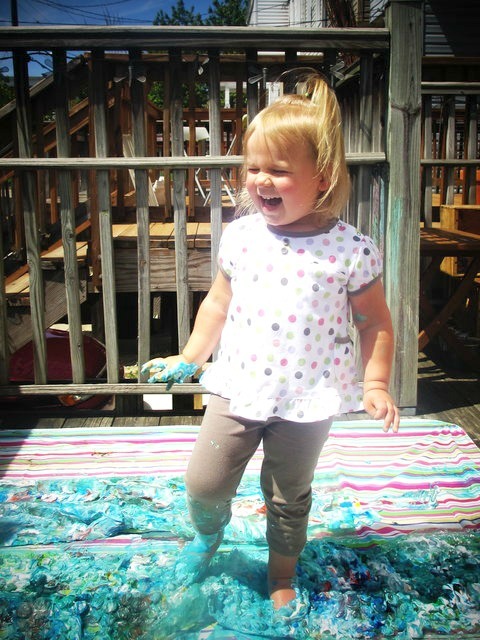 They put the desired crumbles crayons in the jars, put them outside ( it was 109 Fahrenheit at her house that day! Yikes! 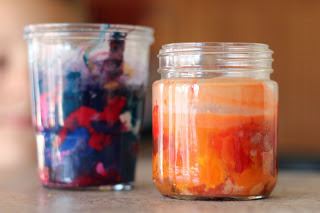 ), let them get slightly gooey and then inserted a birthday candle in the middle of the jar as the wick! She also had the genius idea of adding a crumbled scentsy bar to the candles so they would smell good! I love this! It's inexpensive and generally you will have everything you need to do this, the kids can help and there is nothing you need to worry about! When I originally read the pin I thought for sure they were going to use some tricky way to melt the wax and it was going to end badly but this turned out great! I love the resourcefulness and these would make cute gifts from the kids to grandparents, aunts, uncles, cousins, teachers, friends etc. and it won't break the bank! -Please ensure candles are never left unsupervised! Does anyone have any GENIUS ways for this to work in the winter that won't make a HUGE mess, won't require a double broiler, ruining a kitchen pan and can still involve kids?! Sound off below! We love your feedback! We love getting nerdy and going all "Science Fair Project" with some of our Pinstrosity investigations. It's just fun and it kinda makes you feel like a kid again. Who doesn't love a day when they get to feel like a kid? I always get excited when we have an email from one of you with a full out investigation into a Pinterest pin. When that happens it's like I found a kindred nerd spirit. I love that being a nerd is cool these days. The world needs more nerds. And I say nerd with all the love in my heart...I'm a nerd and I'm proud of it. But moving on. Bri decided to test out a pin that has flown around Pinterest to see if it was all it was cracked up to be. It involves fire and crayons...a project can't get better than that! Bri said we didn't have to include all her pictures...but I thought they helped illustrate her point perfectly, so this post is full of awesome crayon & fire photos. This particular picture I got at http://memecollection.net/emergency-crayon-fact/, but it has been posted on countless sites all over the internet. Bri didn't have Crayola's on hand, but she did have a variety of other brands and decided to give those a try and see how they worked. "So I started with a pink crayon, a lighter, and a paper plate." "Getting the stupid thing to light was a joke and a half. It just kept melting the wax. Then I melted the point off enough that the paper started to burn." "It would tease me though and burn about 30 seconds then create this ashy gray stuff that I would have to scrape off. Then I would get it going again thinking 'this is going to work this time!' Just to have the crayon taunt me back by saying 'no way, you stupid! I can't believe this is what my life is!' Totally heard it in my head the whole time! "So I moved it aside to the crayon graveyard so I could try again!" "Attempt two came with a blue crayon. My husband started getting interested at this point and had the idea to shave off the top down to the paper and cut a slit in the paper to vent it out." "We had a flame that started to last a long time! By that I mean longer than 30 seconds. I did have some gross crayon juice bursting out but that's what the plate was for right?" "The gross crayon juice made a pretty fountain down the whole crayon the flame seemed to remain there until it got bigger and bigger." "It got a little scary." "Then the burning blue flame of death fell over. It was still going strong though." "Now we have only lapsed about 3 minutes of time here. All in all it lasted about 5 minutes and made a big scary mess more than anything." "We poured water on it so that it wouldn't burn through the plate. I was going to get this stupid thing to work." "So we tried a third time with a purple crayon. This time no paper at all." "As we were lighting it the wax just kept melting. So with our melting wax we decided to put it to good use. We used the paper we ripped off the crayon and dipped it in the wax and the attached it the crayon. I know weird idea but we were at a loss!!" "Needless to say it didn't really work." "So we went to the fourth try. We took a black crayon and put the point down on the plate in the melted purple wax." 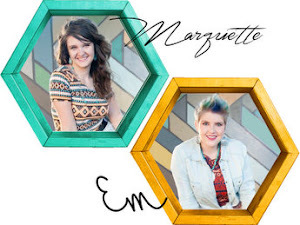 "We also put a slit in the paper because that seemed to work before. Still would not work right." "SO then we decided that instead of lighting it from the top directly what about lighting it from the side. Guess what!? It WORKED!! It lit the top up and burned!!! It did lean on the other crayon but we had fire!" "I felt like I should have been a cave man hitting my chest jumping up and down! It was a great fire! We even roasted some gummy bears on it! (They weren't very good.)" "Now it burned for about 15 minute until it died. The purple crayon went with it. I have no idea where 30 minutes came in. It was pretty bright when we turned off the lights. Was it enough to do chores or cook with probably not. But it was a light of some sorts right? " "So we decided to try it a fifth time with all we learned. So we went back with a pink crayon, with a slit, right side up this time, and lit it from the side." "We had fire for about 30 seconds and then it died with a pink pool of wax..."
"So what did I learn from this mess? 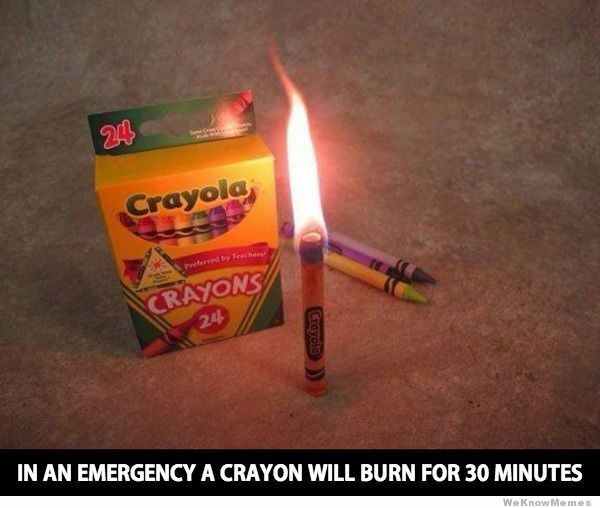 That crayons aren't really good for emergency lighting because it take A LOT of effort to do so. I would rate a 5 on the GCT scale. It did not go up in flames but should have!" So, if the power goes out and you need light...don't reach for your kids' box of crayons (or your own, I have a few boxes of crayons myself). It's not worth the hassle. Unless you just want to kill time...and crayons. So what have we learned here on Pinstrosity about emergency lighting? Crayons aren't the best option. Neither are oranges. But...bacon covered burgers might do the trick for you...only you'd have to prepare them in the dark. I think I feel a theme week coming on. Testing out all those "emergency fire" and "emergency lighting" pins that I've seen out there would be this redneck nerd's best week ever. Oh, now I'm super excited. Bri...you don't know what you started, bwahahahaha. 1:32 pm: After 2 minutes of working with it, I finally got my first crayon (the purple Crayola) lit. I used an almost new crayon and had to get the point melted down to the paper before it would light. 1:34 pm: I got the yellow Crazy Art crayon lit. I broke off the tip as close to the paper as I could so it didn't take as long to get lit as the first crayon. With both crayons I melted the bottom slightly so that it would stick to the plate and stand up better in case the table got bumped. It took me 5 matches (burning both ends on each stick) to get the two crayons lit. 1:39 pm: The progress of the crayon candles. The yellow isn't doing so hot. 1:41 pm: The yellow crayon goes out and doesn't want to relight. It's done. Crayola purple crayon looks to be about 1/2 way burned. 1:49 pm: The purple Crayola is still burning, but it STINKS! 1:50 pm: The Crayola falls over, but is still burning. 1:51 pm: The Crayola goes out. The purple crayon burned pretty completely. It has some crayon juice, as Bri called it, that pooled at the bottom, but most of that was from melting the point off in the beginning. Nearly all the wax burned out of the paper, as you can see in the photo below. So, the Crazy Art burned for 7 minutes and the Crayola burned for 19 minutes. It had a good & steady flame. So one box of 16 Crayola crayons would give you about 5 hours of tedious "candle light". So, it does work...but it didn't burn for 30 minutes. And it was troublesome to get started. And it's stinky. And what a waste of a crayon. But in an emergency, with nothing else...it does work and you can get a small amount of light time out of them. No Heat Curls...Will We Ever Learn?! It's Monday, Don't Forget to Be Awesome!